Service businesses exist everywhere, and starting a service business usually doesn’t require a lot of capital. However, one of the downsides of a service business lies in the very nature of services itself. Services boil down to exchanging time for money, usually to one customer, or at most a handful of customers. For example, an architect gets paid to design a house for a single customer but can’t sell the same design to others. Similarly, a consultant gets paid hourly to give advice to a single client. To earn money, an architect needs to spend more time creating new design while a consultant needs to invest more hours serving new clients. This makes it very difficult for service businesses to scale. 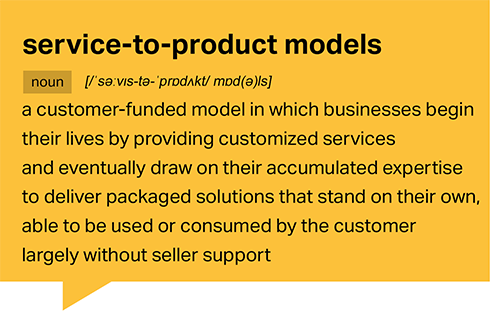 five customer-funded models, the service-to-product model transforms services into marketable products that can stand on their own. We’ll begin exploring the service-to-product model by first looking into how Bill Gates and Paul Allen transitioned from services to products at Microsoft. In 1975, Gates and Allen were building software solutions for companies such as Ricoh, Texas Instruments, and others. Their service business was doing well. At times, they were even paid up to $180,000 up-front, which Gates recalls as being “incredible”. In 1980, IBM hired Gate’s and Allen’s young company, Microsoft, to build the operating system for the secret new “personal computer” that IBM was developing. Microsoft delivered the PC-DOS to IBM, but the story doesn’t end there. 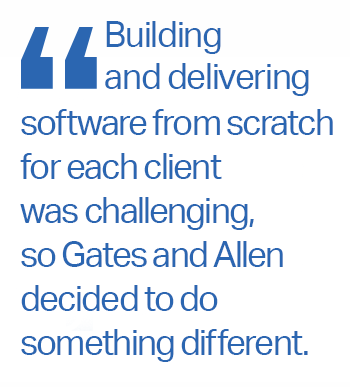 Building and delivering software from scratch for each client was challenging, so Gates and Allen decided to do something different. They structured the contract with IBM in a way that permits Microsoft to provide DOS for any future IBM copycats. As PC penetration grew, Microsoft began developing software products — Windows, Word, Excel, and more — that came in shrink-wrapped boxes. These software products were not limited to just one PC maker, but any PC maker running on DOS. 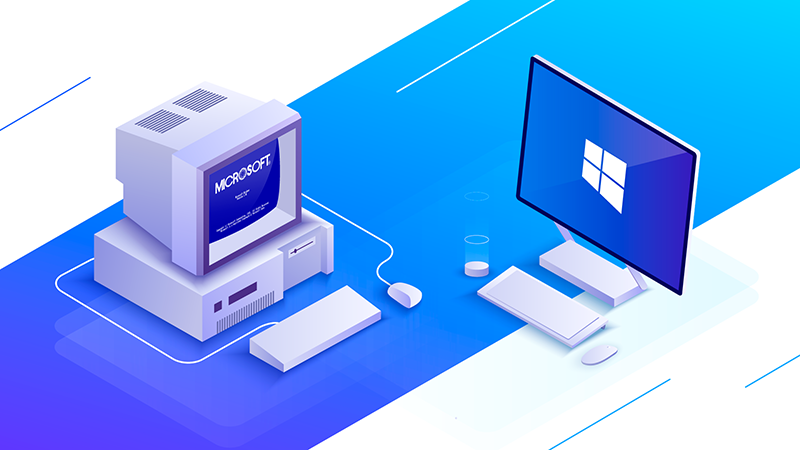 Microsoft had successfully transformed their services into stand-alone products that could be sold to multiple customers without requiring additional time from Gates or Allen. The rest, as they say, is history. In January 2000, Ángel Pérez returned to his native island, Puerto Rico, from the United States with experience in IT. There, Pérez took a job running the small San Juan office of Rock Solid, a Texas-based provider of IT support for Microsoft products. The office and its five employees served a single Puerto Rican customer with a million-dollar service contract. Pérez saw the potential for the business to grow. By 2006, through strengthening and taking advantage of his company’s Microsoft certification and relationships, Pérez had built the Puerto Rican operation to 80 people. The team was mostly supporting business and public sector clients primarily using Microsoft software, and sometimes with Dell, Citrix, Barracuda, and other softwares. Their growth was funded entirely by the customer cash that Rock Solid’s service contracts delivered. Rock Solid was becoming known as the best place to go in Puerto Rico for IT services and support. But Pérez wanted more. In 2006, Pérez saw an opportunity to introduce IT systems into Puerto Rico’s 78 municipalities who were still operating with typewriters, carbon paper, and manual ledgers. Pérez pursued this opportunity by securing a contract with the municipal of Coamo, a forward-looking city of some 30,000 inhabitants. Coamo’s administrative staff quickly adapted to the new systems Rock Solid developed, and citizens quickly noticed a result in the municipal’s greater ease and speed to get work done. Rock Solid won a reputation for adapting ERP and CRM systems to municipal settings. However, Pérez realized that offering their solution as a service was holding them back. If Rock Solid limits themselves to being a service provider who simply implements new IT systems, the municipalities would still need to do a lot of things on their own, such as sourcing PCs, servers, cabling, and power backup, not to mention hiring an IT person because the idea of running their own IT systems was daunting for small towns. With the arrival of cloud computing, Pérez found his answer. 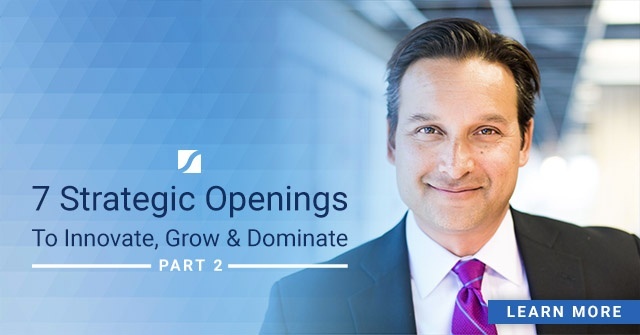 He would transform the services his team was delivering into a SaaS product that future customers could simply run from the cloud. This meant no servers, no cabling, and no permanent IT staff was needed for municipalities to switch to PC systems. City employees would simply log into their internet connections to access the systems. This worked out well for Pérez too, because winning operating contracts required far less bureaucracy than tendering for major capital expenditure projects. By late 2013, Rock Solid had signed up more than a third of Puerto Rico’s 78 municipalities, and had also secured similar customers elsewhere in Latin America. Their profitability soared. Over time, as Rock Solid’s SaaS model improved in efficiency, their customers required less of their time. The service-to-product transition had turned Rock Solid into a customer-funded and highly profitable growth machine. Can Service Businesses Scale Without Transitioning To Products? 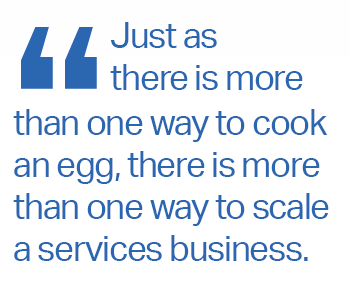 Just as there is more than one way to cook an egg, there is more than one way to scale a services business. That’s what QuEST Global Services, a fast-growing provider of outsourced engineering services, has done. Ajit Prabhu and Aravind Melligeri started QuEST in upstate New York in 1997. Prabhu was doing part-time engineering work for General Electric’s (GE) Corporate Research and Development Center while studying for his PhD. He felt he could do a better job sourcing talent for GE. He provided this service to GE, sourcing talent primarily among his fellow engineering students. In 1998, Melligeri suggested that India could be a source of additional talent at lower cost. So the duo opened an office in Bangalore. The business model was compelling, with GE paying $90 per hour and QuEST paying its Indian engineers about $5. 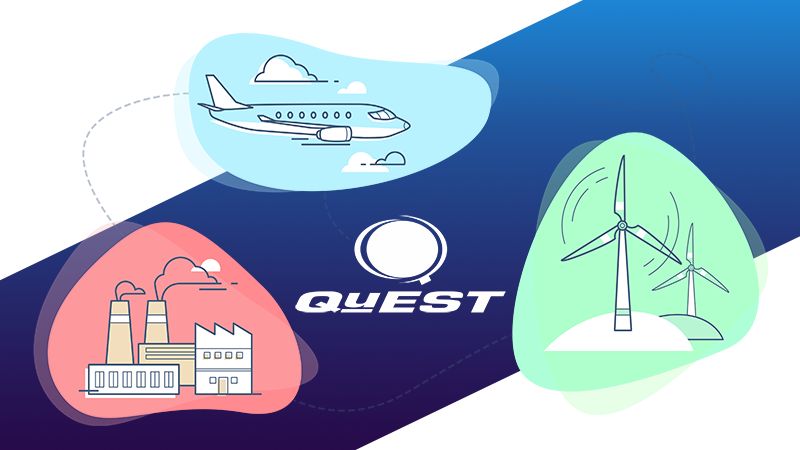 Thanks to the world’s rapidly increasing thirst for energy, and the fact that GE was a leading supplier of gas turbines for power plants, QuEST grew quickly. Just by providing these outsourcing services, QuEST hit $5 million in annual sales by their year end of March 2001 and $14 million by March 2002. GE accounted for about 80% of QuEST’s sales. Then, in February 2003, GE announced it was opening an engineering center in India and that it would take back all of its outsourced engineering activity. Prabhu and Melligeri were stunned. Having lost their biggest client, QuEST’s revenues plummeted. To recover, they had to turn to venture capitalists. Fortunately, Melligeri had already built a good relationship with The Carlyle Group who agreed to a $6 million investment for a 23% stake. 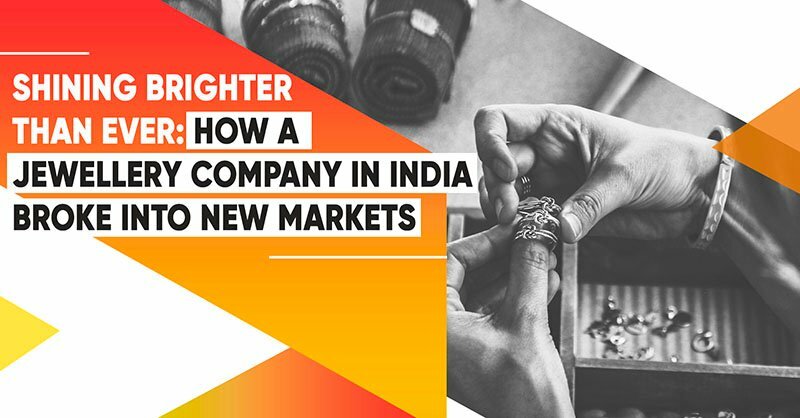 Using QuEST’s already formidable track record for first-rate service delivery and funds from Carlyle, Prabhu quickly set about finding new clients. Soon, Prabhu closed a deal with Rolls Royce. By 2006, other large clients were on board including EADS and United Technologies. In 2004–2005, QuEST’s top line recovered to $19.6 million, and it jumped to $25.8 million in 2005–2006. Profitability rebounded, too, from a $3.5 million loss in the difficult year of 2003–2004 to profits of $2.5 million and $3.8 million in 2004–2005 and 2005–2006. From these case studies, we can come to three conclusions. There are multiple ways to scale a service business. Microsoft turned their software services into products. 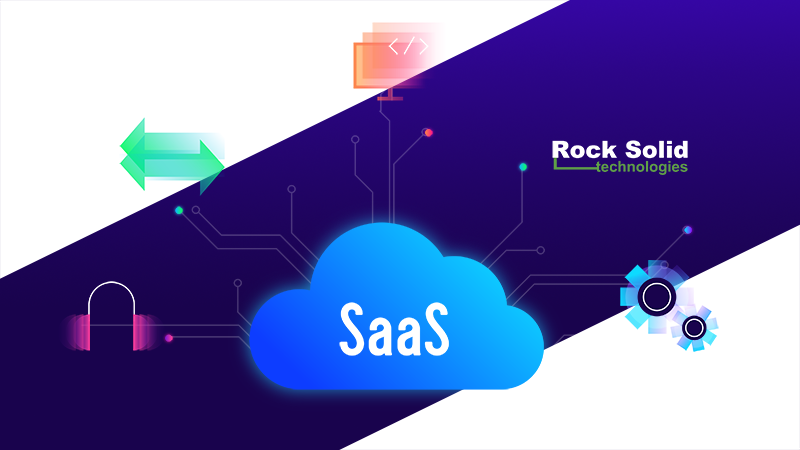 Rock Solid turned their IT services into SaaS. While QuEST relied on VC to secure major clients and scale, although this path did mean they had to endure millions in losses before becoming profitable. Transforming your service business to a product business is a customer-funded approach that gives you the freedom to scale without having to rely on external funding. It also gives you the added advantage of having a product you can combine with other customer-funded models to further scale your business, such as how Rock Solid turned their IT services into SaaS (and so did Microsoft later down the line). Product businesses are often more scalable than services businesses, which seem to require so many more people and more systems as they grow that they often lack any meaningful economies of scale. Being bigger for its own sake may not be what you want. So, whether you’re a budding entrepreneur or someone running an established services business, making a service-to-product transition in your company can be advantageous. Are You Ready to Stand on the Shoulders of Giants? 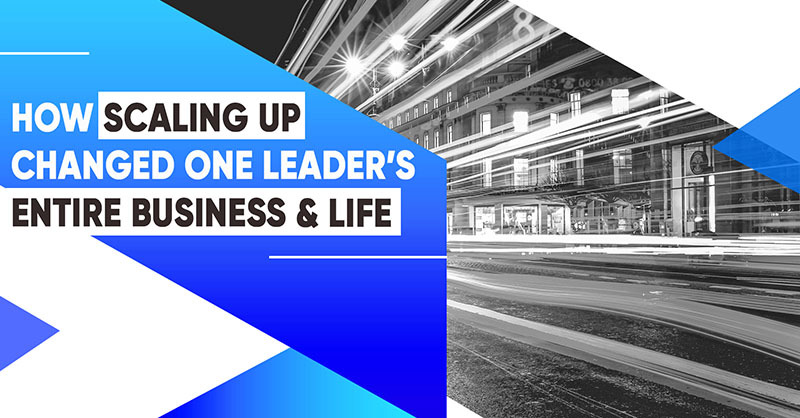 If you’re ready to take your business further and succeed, I invite you to stand on the shoulders of today’s industry leaders by joining Business Growth Lab — a series of free webinars about business topics with top business experts and thought leaders, including many of the people I mentioned here and myself. Associate Professor of Management Practice in Marketing and Entrepreneurship. 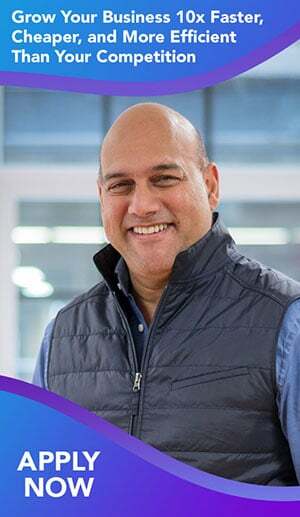 An award-winning teacher and scholar and one of the world’s foremost thought leaders in entrepreneurship, John brings to his teaching and research 20 years of executive experience in high-growth retailing firms, including two ventures he founded and one he took public. 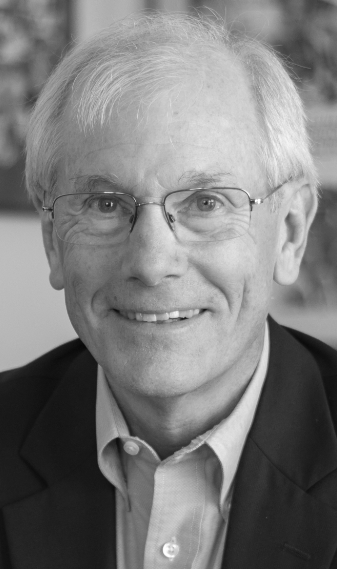 Since becoming an entrepreneurship professor in 1992, John has published five books, dozens of cases and more than 50 articles in a variety of outlets, including Harvard Business Review, the MIT Sloan Management Review, and The Wall Street Journal. His research has won national and international awards from the Marketing Science Institute, the American Marketing Association, and the Richard D. Irwin Foundation. He is a frequent and sought-after speaker and educator for audiences in entrepreneurship and venture capital. Profesor asociado de gestión en marketing y emprendimiento. Es un profesor galardonado, y uno de los principales líderes mundiales en pensamiento emprendedor, John aporta a su docencia e investigación 20 años de experiencia ejecutiva en empresas de rápido crecimiento, incluidas dos empresas que fundó y una que hizo pública. Desde 1992 ha publicado 5 libros, docenas de casos de estudio y más de 50 artículos en reconocidos medios como Harvard Business Review, MIT Sloan Management Review y The Wall Street Journal. Con sus investigaciones ha ganado premios nacionales e internacionales del Marketing Science Institute, la American Marketing Association entre otros. Es un orador muy solicitado para conferencias sobre emprendimiento y capital de riesgo.